Before HTML5, plugins were the only way to view streaming video on the internet. Now that HTML5 video is becoming more popular, custom controls are more popular. We’ll take you through a few options when adding controls on your embedded videos. By using the controls attribute in your code, you’re specifying a minimal set of controls that each user will see. The interface might look different, depending on the browser. However, the controls should at least include Play, Pause, and a Volume. These are the default buttons expected by users. It can also display Captions, Tracking, Seeking, and a Fullscreen toggle. These tags, along with a well written style sheet, can change the and look and feel of the video controls to match the theme of your website. Small visual elements like these can complete a theme, resulting in a consistent experience for the end user. This is one small example of the possibilities HTML5 video makes available to developers. 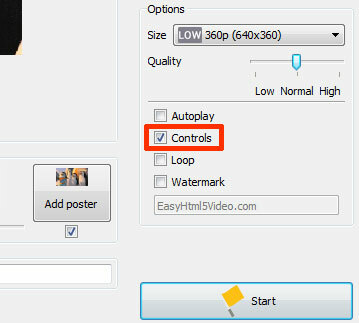 If you’d like to try this format for yourself, check out EasyHTML5Video as it is a great converter of html5 video with controls.